You'll remember that last week I mentioned the Geegeez article that talked about the use of tongue ties and how a horse needs a few runs with a tongue tie before they will let them self go. The theory being that the horse still thinks that it's tongue will get in the way and is worried it won't be able to breathe and so doesnt give all. But after a few runs with a tongue tie it starts to realise that it doenst have tongue problems anymore. So I've been doing some research. First off some facts. All horses wearing a tongue tie for the first time in 2013 & 2014 produces the following big losses. So it seems that wearing a tongue tie for the first time is a negative factor and the losing ROI is such that maybe it has the makings of a lay system. Then it occurred to me that the reason that the horse doesnt perform well first time out with the tie is because it is still worried about a previous experience with breathing and doesn't realise it will be ok with the tie. But surely there are some trainers that use the tie at home and get the horse used to it and trusting it before they ever go racing with the tie on and that maybe there are trainers that win first time-out with a tongue tie. So I had a search for trainers who are profitable with first time tongue tie wearers. For example Rebecca Curtis had 22 starts over the two year period that ran with a tongue tie for the first time. 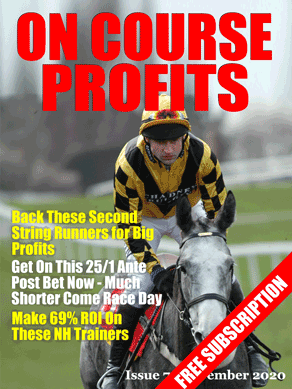 Seven of those won for a 32% strike rate and they made an industry SP profit of 5.86 which is a 27% ROI. Charlie Longsdon had 32 starts and 8 wins and an industry SP profit of 20.3. Which is a strike rate of 25% and an ROI of 63%. I've selected the best performers from 2013/14 and checked their 2015 performance and a good profit has been made so I'm going to run this as a system live for a while and see if we have something worth following long term. It's Betting Insiders day with Nick Hardman (http://bettinginsiders.com ). Today Nick shares one of his trainers to follow at Kempton along with selections for today's racing. Last week we highlighted Keith Dalgleish as a trainer to follow at Southwell and we gave you a couple of systems to use in the coming months. In fact, I have been doing a lot of research on trainer performance during the AW season and subscribers to the Betting Insiders Report were rewarded with a 28/1 winner at Wolverhampton from just one of the trainers highlighted in the December issue. Today, however, I can share with you one of my trainers to follow at Kempton. Step forward Ralph Beckett. I have taken a close look at his performance during the AW season (November to March) in the last 5 years. That may not seem like an earth shattering profit but with the advent of the AW Championships we can see many trainers sending their better horses to the AW tracks in search of much better prize money than in recent years. Ralph Beckett is one such trainer and that is confirmed in his figures for 2014 alone where he has fired in 9 winners from just 24 runners for a level stakes profit of £25.08 at an impressive strike rate of 38%. As we did for Keith Dalgleish we can dig a little deeper and see if there is a particular type of runner that he excels with. Even better news for us is that 8 of those 16 winners have come in 2014 at strike rate of 47%, producing a level stakes profit of £30.08. Get him in your notebook for the coming months. Today I have a few qualifiers from some other systems I am working on. Abi Scarlet is a 6 time C&D winner but Pearl Blue will win this if running to her handicap mark on her fibresand debut so it might be worth a saver on the favourite or put the pair in a reverse forecast. I will be paper trading (or using small stakes) as I road test these systems in the coming weeks. Of the four, Winged Crusader and Balayage look to hold the strongest chances. Today I've nicked a very small part of a detailed article that Nick Hardman wrote for the On Course Profits magazine. The article that Nick wrote teaches readers how to find their own profitable trainer trends and in this excerpt he starts by looking at the leading trainers at Southwell. Keith Dalgleish has a very healthy 28% strike rate and has had a decent amount of runners. By clicking on “Run” we can see the yearly breakdown of the trainer’s performance at the track. Two things are interesting here. Firstly, he has almost doubled the amount of runners he sends to the Midlands track compared to 2011 and 2012. Secondly, his performance in the last 2 seasons suggests his yard is clearly on an upward curve. Again we use Keith Dalgleish at Southwell (AW) from 2011 to 2014 as the basic system to search for a profitable betting angle in HRB. Immediately we can see that all of his profit has come in handicap races. Digging deeper into his handicap performers showed winners came from all age groups across a variety of race distances. The recommendation here would be to back all his handicap runners at Southwell.